Well, it's hot. It's busy. I have so much to do. My life is chaotic. Is that enough excuses yet? I know my blog isn't getting the attention it deserves, but I am sure once the cool weather rolls around I will be back to my regular programming. For now though, I thought i would share the Good bits that other people are doing. This beautiful Hawaiian cake, made for her two year old princess, was made by lovinglifebabymama , a new/old friend of mine. New, in the sense that I just found out about her blog, and Old in the fact that we used to cruise the night clubs together in our high heels. Our disco days behind us, we now focus on our little ones, spoiling them with handcrafted dolly cakes and the like. 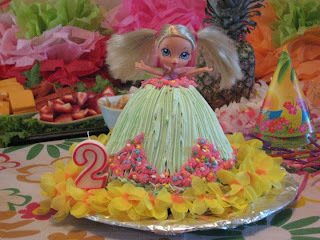 She gives a great description of how she made this amazing cake over on her blog, so check her out and follow her too. She's funny! I am in the midst of mid summer re-organization. My apartment is in absolute chaos. The thrift shop is going to get a nice donation from me, I tell ya, just as soon as I can peel myself away from the monitor and keyboard. My old clunker of a computer has been serving me well for many years, even though my husband scoffs at me over the thin screen of his laptop, asking me to keep the tap tap tap of my old keyboard down. I quite like the sound, it reminds me of a simpler time. I envision myself as a fifties secretary, hammering out my correspondence in an efficient manner, in a plume of socially acceptable smoke, in the midst of a busy steno pool. Except that I can't type, and I no longer smoke. Oh well. I start my Vacation Part Deux in a week or so. Again, no plans to leave town, just to get ready for the start of school for my grade one-er. I got all of his supplies and I have been saving clothes for months, so if I buy anymore for him, it will just be excessive. Clearance sales are my best friend. Well, I am back to sorting, sorting, sorting and purging. Until next time, here are sixty uses for baking soda!